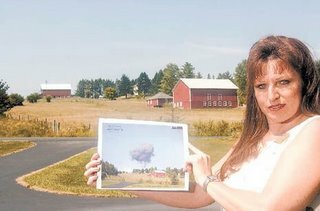 Val McClatchey, 46, took a now-famous picture of the crash's black smoke hanging over a neighbor's red barn. She snapped the picture instinctively but then could not bear to look out her windows again for three days. She drove out recently to the memorial site in her black Camaro convertible to meet with television reporters from one of the national networks. Her picture sells for $20 at Ida's Store in Shanksville, with $18 going to a fund for the victims' families. "There are some people who just can't get past it, and they are out here every day," she said, visiting the memorial for just the fourth time. "It can get a little overwhelming." On Sept. 11, Val McClatchey instinctively snapped this photograph of smoke rising over her neighbor's barn from the crash of United Flight 93 in Somerset County. The photo is now on sale at a local store for $20, with $18 benefiting the families of the victims.